Concepts have always been foundational to the social science enterprise. This book is a guide to working with them. Against the positivist project of concept "reconstruction"—the formulation of a technical, purportedly neutral vocabulary for measuring, comparing, and generalizing—Schaffer adopts an interpretivist approach that he calls "elucidation." Elucidation includes both a reflexive examination of social science technical language and an investigation into the language of daily life. It is intended to produce a clear view of both types of language, the relationship between them, and the practices of life and power that they evoke and sustain. After an initial chapter explaining what elucidation is and how it differs from reconstruction, the book lays out practical elucidative strategies—grounding, locating, and exposing—that help situate concepts in particular language games, times and tongues, and structures of power. It also explores the uses to which elucidation can be put and the moral dilemmas that attend such uses. By illustrating his arguments with lively analyses of such concepts as "person," "family," and "democracy," Schaffer shows rather than tells, making the book both highly readable and an essential guide for social science research. A century after Dilthey, we are familiar with what interpretivists are opposed to. Now we know what one extremely clear-thinking member of the tradition thinks interpretivism ought to mean with respect to social science concepts. Written in a plain-speaking and practical way, the book speaks to more than concepts: although interpretivists will be the main consumers, noninterpretivists will be curious to see the contents. Elucidating Social Science Concepts should be celebrated as a landmark achievement in the field. In this slender volume, Frederic Schaffer elaborates a powerful account of what it might mean to take an interpretive approach to concepts in social science research…. I cannot remember the last time I read a book that had such a fundamental effect on my understanding of what it means to do interpretive research – and what defines its distinctive contributions to social science. For the reader new to the study of political vocabulary, or seeking to incorporate concept analysis into one’s own research agenda, there is no better introduction than Elucidating Social Science Concepts. This is no standard introductory text, however. In Elucidating Social Science Concepts’s second role, Schaffer offers his own trenchant intervention into the growing debates over the nature of concepts, their role within linguistic and social life, and their value to social scientists. With this volume, Schaffer’s real contribution is the stimulating deployment of language, example and imagery to initiate a process of political imagination that is quite needed in political days such as these we face…. It would be a serious mistake for this guide to be read only by interpretivists. 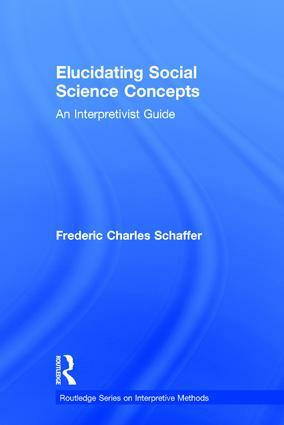 In Elucidating Social Science Concepts: An Interpretivist Guide, Frederic Schaffer makes a crucial intervention. Not only does he show us why and how concepts are critical in shaping research questions and findings, he also offers clear suggestions for scholars looking to engage thoughtfully with the concepts they use. The book adopts an interpretivist approach, yet it is a critical read for every social scientist. Frederic Charles Schaffer is a Professor of Political Science at the University of Massachusetts Amherst. He served two terms as chair of the Committee on Concepts and Methods of the International Political Science Association and teaches ethnographic methods at the Institute for Qualitative and Multi-Method Research, which is attended each summer by approximately 180 participants from schools, departments, and research centers around the world. A past Program Chair for the Interpretation and Methods Conference Group of the American Political Science Association, he now serves as a member of the Group’s Executive Committee. Schaffer is the author of Democracy in Translation: Understanding Politics in an Unfamiliar Culture and The Hidden Costs of Clean Election Reform, and the editor of Elections for Sale: The Causes and Consequences of Vote Buying.